IIT JAM Syllabus 2019 Pdf Download: IIT JAM exam will be conducted through Computer Based online mode. In IIT JAM there will be 7 test papers and candidates need to complete their respective test paper in three hours. In this article, we are providing IIT JAM Exam Pattern and Syllabus to boost up your preparation for the examination. We are also providing the official IIT JAM Syllabus PDF so you can download it easily. The Exam will be conducted through the online Computer-based mode in two sessions. There will be 3 types of questions in the Question Papers, and the IIT JAM Paper will be in the English Language. Other details are given in the IIT JAM Exam Pattern Table. Numerical Answer Type (NAT) questions. Marking Scheme Negative Marking of -1/3 Marks for each wrong Answer in Section A Only. There will be a variety of subjects in the papers. The IIT JAM Syllabus will be mostly based on 10+2+3 Courses and Subjects. The Complete details are given below. Above we have included subjects and their topics, now if you want to get complete syllabus you can follow the link and download the complete IIT JAM Syllabus 2019 PDF. So Download the syllabus and start your Preparation. Previous Year Question papers are one of the most helpful things in our preparation, and that’s why we have also collected all the available Question papers of IIT JAM. Your surprise, we have collected more than 10 Year IIT JAM Previous Question Papers. The link will be given here, so wait for it. 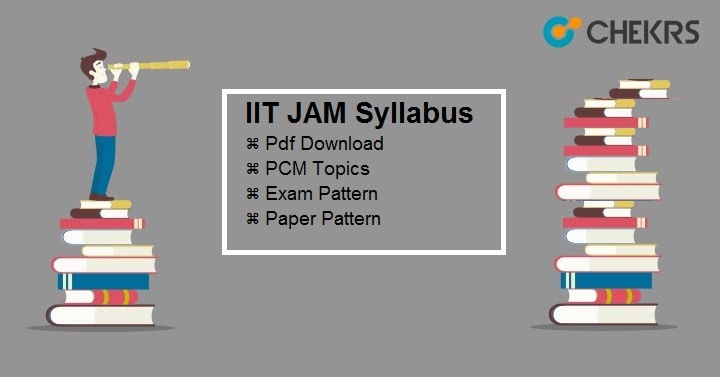 That’s it guys, We would like to conclude this post about IIT JAM Syllabus 2019 Pdf Download, PCM Topics, Exam Pattern, and previous year papers. But the work has not been completed yet, we will back with another helpful article soon. Good Luck, Keep Visiting/ sharing. We will see you soon.